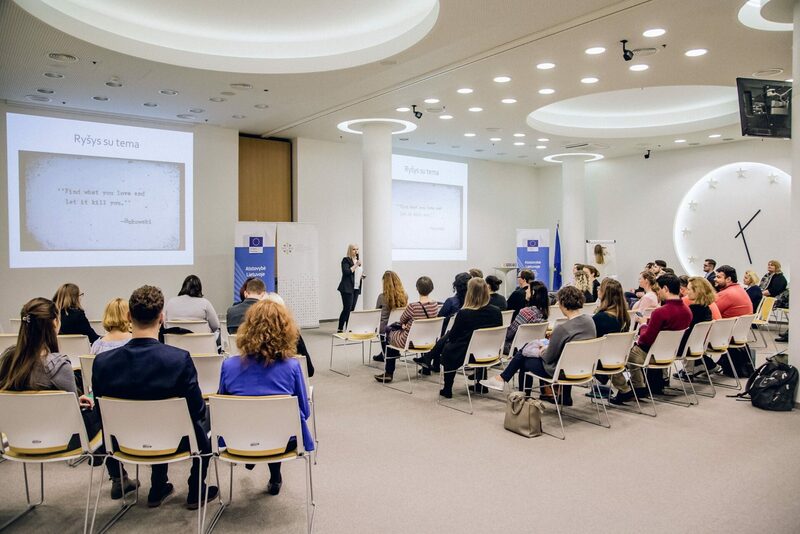 As a part of 30th anniversary of Erasmus+ and opening European Youth Week on the 28th of April in the European Commission main office in Lithuania a meeting of NGO was held. Where representatives of the organizations had a chance to share opinions and success of the Erasmus+ and EVS Voluntary programs. The important aspect of the meeting was debunking a myth that Voluntary is nothing serious and does not help young person to find oneself in life. Lecturers gave many examples how the Voluntary can develop personality and improve attendance in life of youth with lower chances. Successes of the project „Žinau, ką renku“(I know who to vote for) have been shown, which aimed to create a dialogue between young voters and politicians by debates organized by over 200 volunteers, or regional Park of Sartai and Gražutės cities, encouraging young people with lower chances to work outdoors. EFHR wants to thank Jaunimo tarpautinio bendradarbiavimo agentūra (Agency of International Youth Cooperation) for invitation and is sure that successes listed at the meeting will encourage young people to work voluntarily.